On Friday December 16th 2011 The Symphony Orchestra of the Royal Conservatoire played ‘Die Walküre’ (act 1) by Richard Wagner, at the beautiful concert hall ‘De Vereeniging’ in Nijmegen. 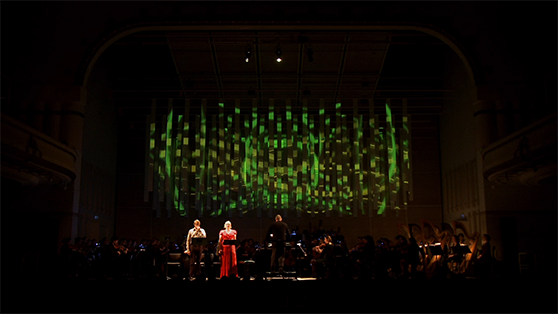 The AR Lab was invited by the Royal Conservatoire to provide visuals during this live performance. 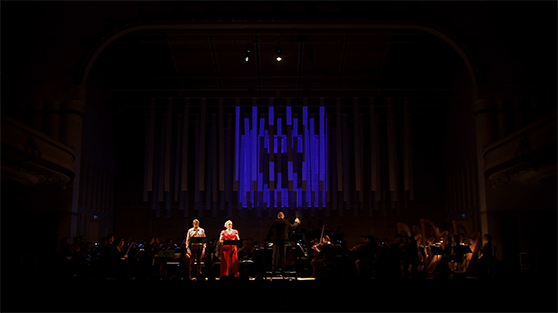 I supervised students from different departments of the Royal Academy of Art The Hague and together we designed a screen consisting of 68 pieces of transparent cloth (400×20 cm), hanging in four layers above the orchestra. By projecting on this cloth we created visuals with an illusion of depth. We chose 7 leitmotivs (recurring theme, associated with a particular person, place, or idea), and created animations representing these using color, shape and movement. These animations were played at key-moments of the performance.